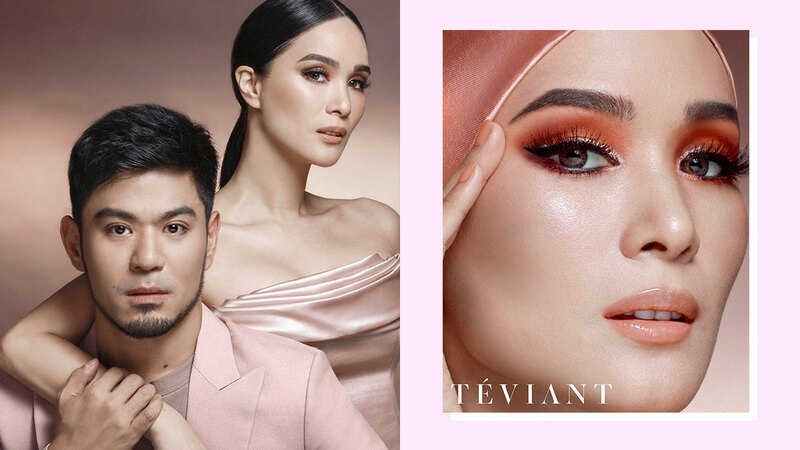 To mark his 10th year in the Philippine makeup business, celebrity makeup artist Albert Kurniawan unveiled the first collection of his makeup brand, Teviant. His launch includes a collaboration with longtime friend and muse, Heart Evangelista! The Teviant x Love Marie line has four 12-pan eyeshadow palettes named Queen, Mademoiselle, Señorita, and Amore. Each one has sets of colors that can suit different personalities. When we asked Albert why he chose to launch eyeshadows for his first collection, he answered: "Because that's [eye makeup] my strength and I want to embrace it. People will believe in my product because they know that I am good with selecting eyeshadows [for my clients]." Aside from his collab with Heart, Albert also came out with glitter liners, felt tip pen eyeliners, eyebrow products, mascaras, and false eyelashes. How can I pull off colored or bold eye makeup? Most of his palettes have bold colors like blue, orange, and purple—which can be intimidating for most Pinays. Albert shared tips to convince us to (finally) wear colored eye makeup: "Makeup is all about balance. Either balancing the texture or balancing colors. In my case, I am known for bold eye makeup. So kahit sabi ng mga tao, 'Ang kapal mo mag-makeup,' or 'Parang matapang yung mata,' pero that's what I'm known for e. If you really want to wear colorful eyeshadow, tone it down. Like for example, when you use blue, balance out the rest of your face with warm colors. On the other hand, if you want to wear warm eyeshadow, try to balance it with a cooler color. Or if you want to wear glittery or shimmery eyes, you have to match it with skin that has a velvet finish." How do I make chinita eyes look more doll-like? He also emphasized that there is a special eyeliner technique for chinitas: "Extending the eyeliner is important. Because a lot of chinitas like to wing it upward, but with that they end up looking more chinita. So if you notice, with Heart, every time I do her makeup, I prefer to extend it straight to the side so it looks rounder, more almond-like and expressive." Lastly, how did you convince Heart to wear colored eyeshadow? Heart is known for having a signature look. And like everyone else, she used to be intimidated to wear vibrant and bold eyeshadows. That is, until Albert was finally able to convince her to try it! He explained that because they've been working together for 10 years they trust each other completely. "She knows what I can deliver and she's confident that I know what she wants. We trust each other that much." Aww! Teviant Cosmetics is now available for pre-order at Teviant.com.